The warm May weather has at last arrived! Vegetable gardeners can now sow seeds or transplant whatever eatable options meets their fancy. If you are like me and 85 percent of American gardeners, planting one or two tomato plants is an absolute rite of spring. Smelling the unique odor of the tomato leaves and stems fills my mind with images of juicy red slices in sandwiches and of bowls of gazpacho. Most vegetable aficionados expand from just tomatoes to include other popular plants, such as peppers, cucumbers, lettuce, carrots, and onions. 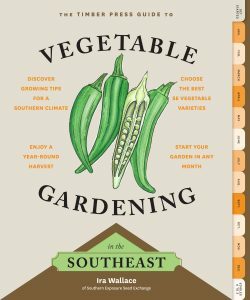 If the fresher taste and greater nutrition of locally grown foods have you yearning to become a better gardener, The Timber Press Guide to Vegetable Gardening in the Southeast (Timber Press, 2013) should be required reading for you. The author, Ira Wallace, is well qualified to write a book on gardening for the Southeastern section of the country. She was raised gardening in Florida and currently resides in the cooperative Acorn Community in Virginia. There she is a master gardener and worker/owner of the Southern Seed Exposure Exchange for organic and heirloom plants. This company sells approximately 700 seeds for plants that flourish in the Southeast. Wallace begins her volume with a “Get Started” section on garden planning. This part includes explanations of the various temperature and moisture differences in areas of the Southeast, such as coastal plains, Piedmont, and mountains. One of the more interesting items, a natural gardening chart, assists with determining planting times in our era of changing weather patterns. This list connects the blooming of familiar plants, such as dandelions, daffodils, redbuds, forsythia and others, with the proper times to plant specific vegetables. The “Get Planting” section provides activities for the twelve months of the busy gardener’s year. Covered here are the when, what and how for any aspect of vegetable gardening that you will need. Seed propagation, transplanting, successive planting, and simple structures for heat and cold protection are all clearly explained. Introducing the section, “Edibles A to Z,” are separate charts for the lower and upper Southeast that indicate differences in times for planting and harvesting vegetables for the two areas. Artichoke to zucchini, including common Southern vegetables and a few that have recently appeared on restaurant menus, are discussed here. Information on growing, harvesting, best varieties for the Southeast, and how to save seeds is provided for each plant. During an interview, Wallace described her book’s goal as “let me lead you into a new world of seasonal, fresh, local food.” She continues by correctly stating that her book “will help you save time and energy while growing your own food sustainably.” Wallace’s claims are supported by the volume’s detailed content, and its recognition as a Notable Book by the Southern Garden History Society.